Central Park family photos? Check. Christmas studio session? Check. Ridiculous fun and cookies for all (photographer included)? CHECK and YES! Toddlers can be tough customers. When I shoot families with young children I always give that "nice" everyone smiling at the camera image a go, but I don't expect it will happen. You know what will happen? Young kids will do what they want and I will guide a fun filled adventure sure to create images that capture the child's personality and all the fun. Finn did not disappoint at this session. 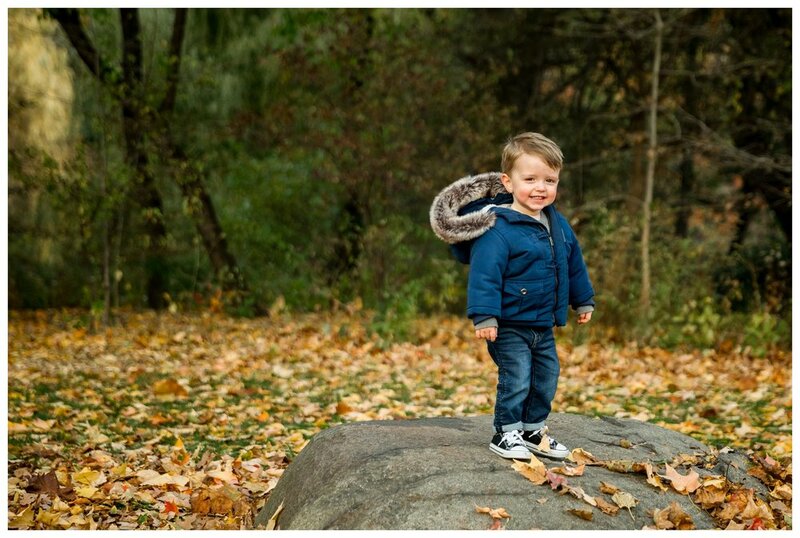 He wanted to drink lots of water rather than cheese at the camera, so we played in leaves, admired the ducks in Central Park, and hit the playground. We played until the light was gone and then hit my studio for some adorable Christmas pj portraits complete with fresh baked cookies. Be sure to check out the last image of him walking off the set very pleased with himself after a killer double session and a tummy full of cookies and milk.